Typically, incentives are provided by the health plan in the form of reduced or waived prescription costs, reimbursed gym memberships, and other methods. We contact high risk plan members to let them know about the incentives, and the benefits of improving their health. All plan members must meet established criteria to qualify for enrollment in our program. 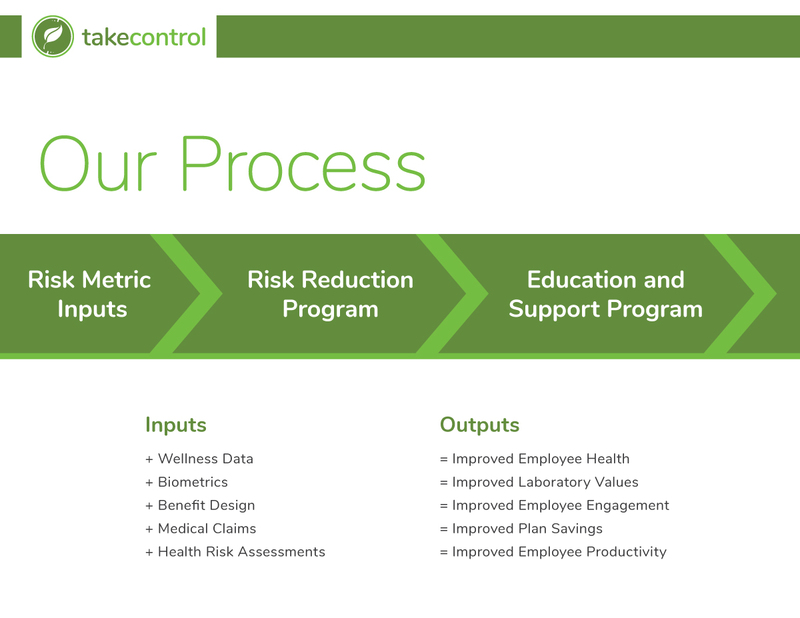 Once enrolled in the Take Control program, we conduct a comprehensive assessment of each member’s health; and develop a custom lifestyle improvement plan to reduce their risks. Our custom plan and one-on-one coaching set us apart from many “canned” disease management programs that provide limited, brief calls and online tutorials that are neither engaging nor effective. Our program teaches plan members how to make life-long improvements to their health, and our one-year program length gives them time to turn these changes into habits. Our health coaching includes intensive one-on-one monthly phone sessions with licensed dietitians, exercise and sports science specialists, and certified diabetes educators. Our health coaches are trained in nutrition, health education, corporate wellness, and behavioral health. Your plan members will be coached by our professionals based on their individualneeds, as determined by their custom coaching plan. Just as every person is different – motivated differently, accomplish goals differently – our programs are unique and dynamic. We constantly assess, and either confirm that our participants are on track, or re-direct and update their plan. This ensures better long-term success, and better clinical outcomes. In addition to the intensive one-on-one sessions, our participants also have access to a blog and videos written in-house by our staff, featuring motivational nutrition, exercise, and emotional health articles. They also have access to the “members only” area of our web site, that features even more comprehensive content about health and healthy lifestyles, as well as forms and benefit documents specific to their group plan. The benefits we can provide is unlimited, and can be customized based on the needs and goals of each group. Examples of additional benefits that some groups have added include reimbursements for health and fitness clubs, reimbursements for additional physician visits, covering the costs of a sleep study, and authorization of additional psychotherapy or EAP counseling sessions. Read more about our financial outcomes.